Old couple facing eviction. Photo: Dave Hendley, text: David Secombe. Posted: November 16, 2012 | Author: thelondoncolumn | Filed under: Housing, Street Portraits | Tags: Dave Hendley, Digital Gap, Fulham eviction | Comments Off on Old couple facing eviction. Photo: Dave Hendley, text: David Secombe. Everyone’s got an uncle Bill. And everyone’s got just one picture of him. Uncle Bill died before you were born. The photo is your mum’s, taken on a trip to Hayling Island when she was a girl. And she shows you this photo, a tear at the corner of her eye, ‘That’s your Uncle Bill’ she says. And she hands you a tiny black and white picture of a man in a suit standing in the middle of a field. That’s your Uncle Bill. Well, it was my Uncle Bill. Who was called Norman. Your Uncle Bill was probably called Cliff. Or Lance. 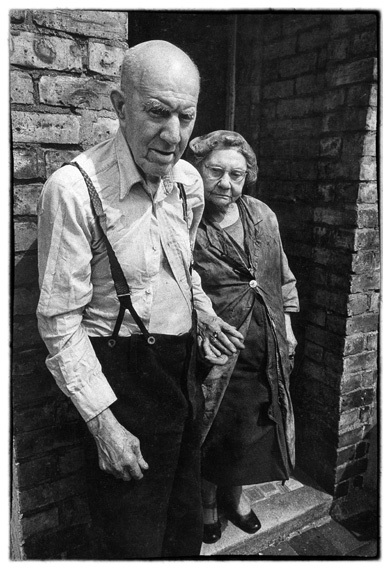 In the final of the series of Dave Hendley’s rediscovered 1970s photos, this image shows an elderly couple outside their house in Fulham; they were facing eviction from their home after living there for decades. That is as much as I can tell you about the facts of the picture; Dave doesn’t know what became of them or the house itself (if it wasn’t flattened for redevelopment, it is probably now one of those candy-coloured terraced houses that go for over a million pounds). I’d like to know the full story, but perhaps it’s as well I don’t. I imagine the outcome was shabby and depressing: the early 1970s was not a glorious era for social housing in London. Dave’s photographs this week are fragments of a lost career, and these pictures only exist because he left some old prints at his mother’s house. I don’t know why Dave felt compelled to chuck his old negatives, but he was young when he did it and perhaps didn’t reckon on their value as a permanent record. Now that almost all photographs exist as pixellated images that never get preserved as hard copy, it is sobering to consider the implications for the future. Dave ditched his negatives and got old enough to regret it, but fine prints were (accidentally) preserved. Today’s toy-like cameras make images that are no more durable than an ice sculpture. Photography is becoming utterly ephemeral: you aren’t creating a graven image, you are generating a string of code. Then, a bit later, maybe you get short of space on a memory card so you ditch a few images you don’t think you’ll need, or you forget to back them up, or the hard drive they were on went down … you won’t recover those pictures in anyone’s attic, they are gone. The future is bright and shiny and cares not for the past. Even those of us still using film wince at the price of ‘traditional’ materials: posterity carries a premium. What did Uncle Bill look like again? 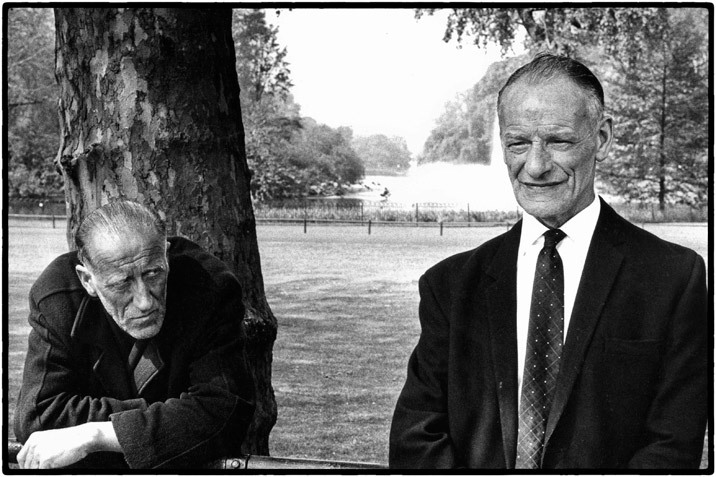 Posted: November 15, 2012 | Author: thelondoncolumn | Filed under: London Types, Parks, Street Portraits | Tags: Andre Kertesz, Dave Hendley, David Hockney, Elliott Erwitt, Entertaining Mr Sloane, Harold Pinter, Joe Orton, Robert Frank, The Servant | Comments Off on In St. James’s Park. Photo: Dave Hendley, text: David Secombe. Robert Graves visits London and wishes he was back in Deya. Photo: Dave Hendley, poem: Tim Turnbull. Posted: November 13, 2012 | Author: thelondoncolumn | Filed under: Bohemian London, Literary London | Tags: Dave Hendley, Deya Mallorca, Robert Graves, Tim Turnbull, Transit Van | Comments Off on Robert Graves visits London and wishes he was back in Deya. Photo: Dave Hendley, poem: Tim Turnbull. 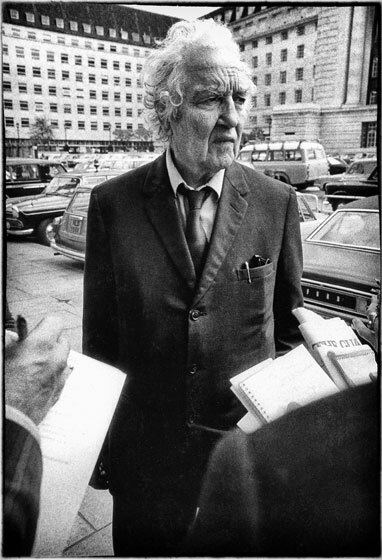 Robert Graves at County Hall. © Dave Hendley 1973.
and scrunch into the battered Ford twelve seater. the weather’s always sunny where we’re heading. on the minibus that bears us to our graves. 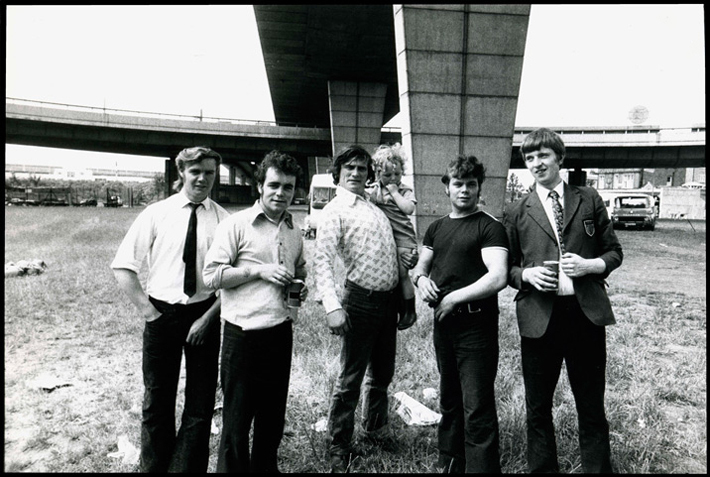 This week we feature some photos from Dave Hendley‘s 1970s archive; I say ‘archive’, but in fact the ones we are running were rescued from Dave’s mother’s attic, and are survivors of an ill-advised cull that Dave made of his work some decades ago. The photo above was taken for The Times; a photo call at an event to honour Graves, who looks massively uncomfortable – which is perhaps unsurprising, given that he hated to leave his beloved home in Deya, Mallorca for any reason whatsoever. 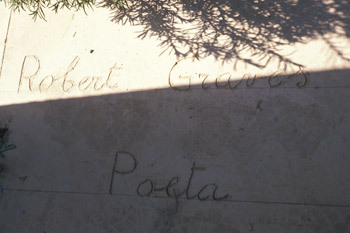 Graves’s tomb, Deya, Mallorca. © David Secombe 1990.